Everything we do here at Sovereign Man falls either under defense or offense-- including our products. Think about offense and defense the way a sports team does. Nobody wins a championship only with good defense or offense. In this case, defense is all about safeguarding what you already have. This includes risk prevention and increasing your freedom. It ensures that everything you have worked for - and will achieve - over your lifetime is safe, no matter what. It creates a strong foundation from which you can build your offense. It means increasing your prosperity, opening up more opportunities and growing your wealth. Below you can find our premium products, all of which have been specifically designed to help you build both an incredible defense and offense. Sovereign Man: Confidential (SMC) is our flagship International Diversification Service. Strategies such as obtaining a second passport (potentially for free), opening an Offshore Bank Account, and even delving into low-risk/high-reward investment strategies outside of the mainstream. It delivers all of this through a comprehensive video library, regular intelligence reports and live teleconferences with Simon Black himself. Sovereign Man: Explorer (SMX) is our quick-start International Diversification Blueprint. This intelligence service will help you implement the three most critical Plan B strategies in short order. We designed SMX for people who are not quite ready to jump in with both feet and become members of Sovereign Man: Confidential, but who still want to start implementing the most critical of our solutions. Inside, you will find step-by-step instructions on how to protect a portion of your savings by opening an Offshore Bank Account in a well-capitalized, stable jurisdiction, how to obtain a foreign residency, and how to start on the path to a second passport. Additionally, you’ll learn basic strategies for legally reducing your tax burden, getting into foreign currencies, and much more. This is the single most important intelligence report we’ve ever published. Never before, in our nine-year history, have we created a single report that outlines every step you need to take to protect your family and livelihood, gain more freedom and even potentially increase your wealth substantially. It contains a decade of actionable knowledge we’ve acquired traveling the globe, meeting with top lawyers, bankers and government officials. The 4th Pillar is our premium investment service, in which we recommend some of the most compelling, no-brainer, deep-value investments available anywhere in the world. Our recommendations are typically high-quality, profitable companies whose shares are so overlooked, and so absurdly undervalued by the market, that the shares are selling for less than the amount of cash the company has in the bank. When you buy shares of companies that are this deeply undervalued, you're significantly reducing your risk while exposing yourself to exceptional investment returns. The service includes a monthly, comprehensive investing newsletter detailing the exact portion of your “4th Pillar portfolio” to direct towards specific companies. We also send you real-time alerts with critical, time-sensitive updates. Sovereign Man: Private Investor (SMPI) is our private equity deal service in which we scout opportunities, perform due diligence, and present our findings to members. We negotiate favourable terms for these deals thanks to our powerful network, and you can choose whether you'd like to invest alongside of us. With the potential for incredible returns, the ability to avoid manipulated markets, and with significantly increased transparency, SMPI is a sharp tool in the arsenal of any current or future private equity investor. 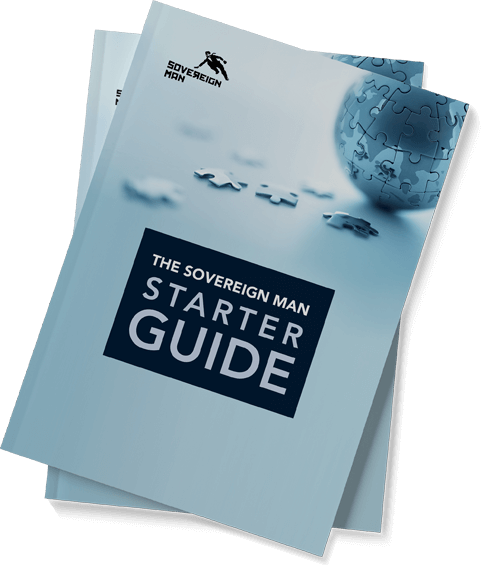 Total Access is the top tier of membership at Sovereign Man, where members get access to private opportunities and other information that are too sensitive to put into print. This means you'll get direct access to me, and to my trusted inner circle. You'll be invited to exclusive events and gain complimentary access to all of our products... and much more.